Luke Skywalker and Darth Vader each pose with lightsabers drawn, ready to duel each other or anyone unlucky enough to cross their path. These miniatures are found exclusively in the Core Set. Two squads of Rebel Troopers (each with seven unique miniatures) stand ready to fight for freedom on any battlefield. Five are armed with A-280 blaster rifles, while two heavy weapons specialists carry a Z-6 rotary blaster cannon and an MPL-57 modified to fire ion torpedoes. A bipedal AT-RT miniature lends extra firepower to the Rebellion with three options for customization, allowing you to equip your AT-RT with a rotary blaster, a laser cannon, or a flamethrower. This version of the AT-RT is found exclusively in the Core Set. Two squads of Stormtroopers (each with seven unique miniatures) are ready to crush the Rebellion wherever it rises. Five are armed with their trademark E-11 blaster rifles, while two heavy weapons specialists carry a DLT-19 heavy blaster rifle or an HH-12 rocket launcher. One squad of two 74-Z Speeder Bike miniatures invites your Imperial Scout Troopers to zip across the battlefield at lightning speeds. 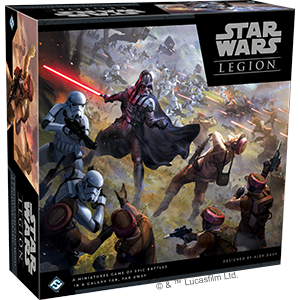 The squad leader miniature (pivoting in his seat to fire behind him with his blaster pistol) is found exclusively in the Core Set. Miniatures require assembly and are unpainted, paints and glue not included.